KINDERTRAUMA: What is the first movie that ever scared you? PAUL KELMAN: Ha! Good one! 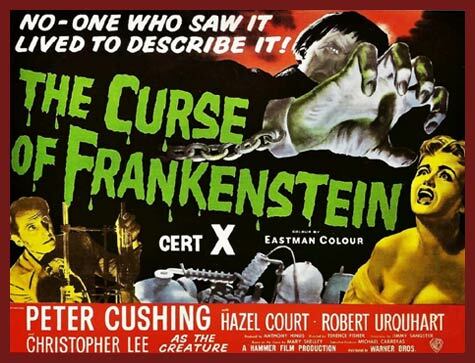 It was “Curse of Frankenstein,” 1957 Hammer Films with Peter Cushing playing the Doctor! I was around 8 or 9 years old. It was my first horror movie! My Father took me and I spent most of the time slumped down below the seat in front of me, peeking up every little while! It really terrified me! I had dreams about it for days after. The Monster was so horrible looking! I can still remember how scared I was. Since then I’ve seen the original, Boris Karloff, Frankenstein of 1931 by Universal, and the subsequent ones he did and other versions as well. 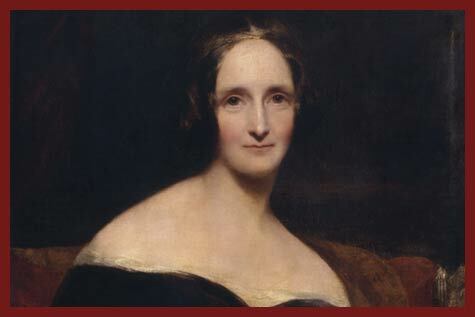 Then I read the book by Mary Shelley! I’ve always been intrigued and fascinated with the “Monster” or “Creature” as he is called in the book. And after reading it, Frankenstein became one of my heroes! In the book he is intelligent and sensitive and speaks eloquently about his plight. But he is consumed with the grief and anger from not being accepted by humanity and most of all by his ‘father’, his ‘creator’, Dr. Frankenstein. His feelings eventually drive him mad. He realizes he is hated, useless, without roots, without family, an “abomination”, a “monster.” He is without a father, without God, without love. He is lost. It’s the story of each of us looking for meaning and our purpose in this life, and our common humanity. Without these fundamental needs being fulfilled and realized, we become like a monster to ourselves and to others. That’s the story Mary Shelley wrote. 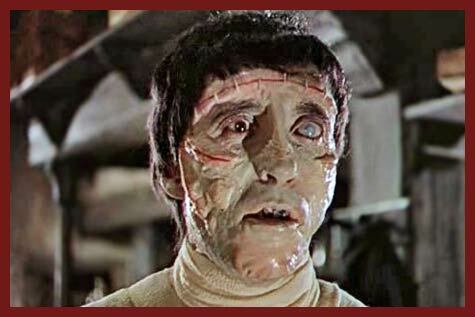 That is Frankenstein. It’s a great book, a great story. And it’s spawned some wonderful horror films! KT: What is the last film that scared you? PK: Well I don’t get ‘scared’ anymore! (laughing) Having done films I look at special effects and CGI. I see the artifice. I was also in the virtual reality industry for around a decade, so I have a good grounding as to what can be done with computer generated reality, especially in three dimensions. But I still get excited and allow myself to be taken in, especially if it’s well done. I don’t get scared, too old for that. But I do get ‘spooked’ sometimes! I like films that spook me! Even if they’re a little raw as a finished product. It’s how a film uses your imagination in concert with a new or macabre concept that achieves that. 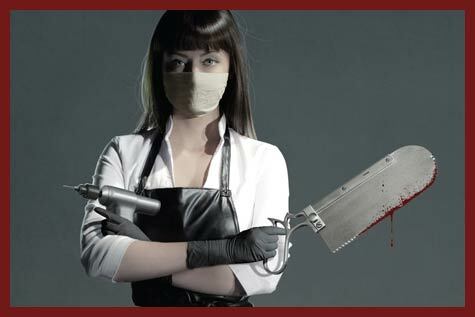 Recently I saw a macabre psychological and gory vision in a film called, American Mary (2012, Canadian) starring Katharine Isabelle and written and directed by The Soska Sisters! It’s a pretty wild film centering on a young female student surgeon who stumbles into a career in illegal “body modifications.” Macabre and strangely engrossing. Liked it! It had a spookiness about it because of what was behind this girl’s motivation. Her obsession with it just kept growing out of control. The film was a little choppy and inconsistent but I thought it was very good despite that. 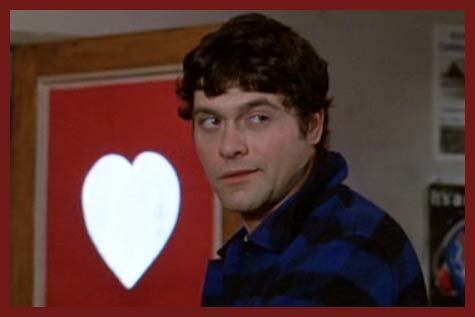 KT: What is your fondest memory from working on MY BLOODY VALENTINE? PK: I think it was when we got to hang out with real miners and they took us down to the “Face” in a real working mine at Glace Bay in Nova Scotia, an Island Province in the East coast of Canada. We were crouched down in this low tunnel only about twelve feet wide and five feet high. A tight fit. The Giant Drill bit took up five feet in width! We stood along side it as it drilled into the Face, black coal dust flying into our goggled faces! One miner hosing tons of water on the bit to cool it down! The noise was deafening and one wrong move and the massive Drill blades would shred you! Talk about a dangerous job! Some of these guys had been miners for thirty years! 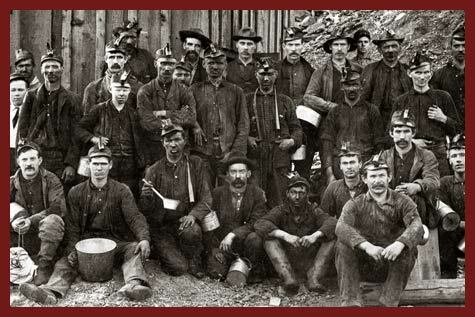 Most had sons who also worked the mine. The work was passed down through generations. I learned to respect these men. They were crazy brave and they felt they were doing a service to people by mining coal which heated homes and provided energy. Nowadays we look at coal as an outdated mode of energy and a hazard to mankind. 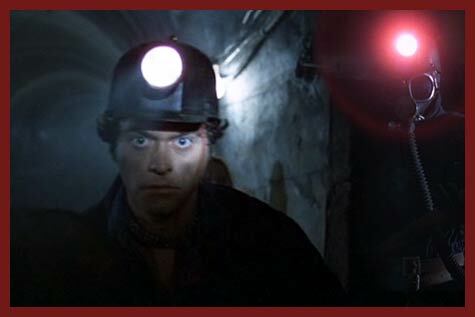 Anyway, the point being is it gave me and the other actors a real sense of what it was to be a miner so we could play one. The camaraderie, how they watched each other’s backs, the importance of family and the honor code of a miner all served to inform our roles in the movie. I like to think of them as, “Coal Cowboys”! The other thing that I remember most is the talent, energy and commitment of the cast! It was like working with an ensemble. There was this raw almost amateur enthusiasm to make every scene work! 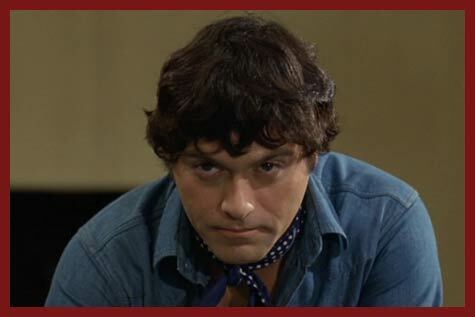 There were some real pros like Don Francks (Sheriff Newby), Patricia Hamilton (Mabel) and Jack Van Evera (Happy). 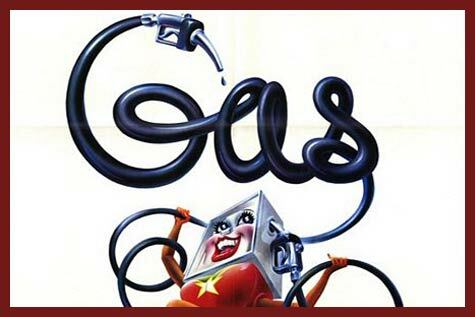 Then there were Keith Knight (Hollis), Alf Humphries (Howard) and I as “T.J.”, who’d worked together before in another Paramount release, GAS, which was a crazy comedy. But we’d only done a few films. The rest of the cast had done a little film work at best. So it was quite the mix. Yet everyone, once they got on the set, became pros with equal talent, dedication and devotion to their work! That was special and I think it showed in the final film and is part of what makes the film different from other horror/slasher films especially in the 1980’s! The characters had genuineness about them and the audience could relate and care about them! I do think it’s a major part in what has made the film last this long. 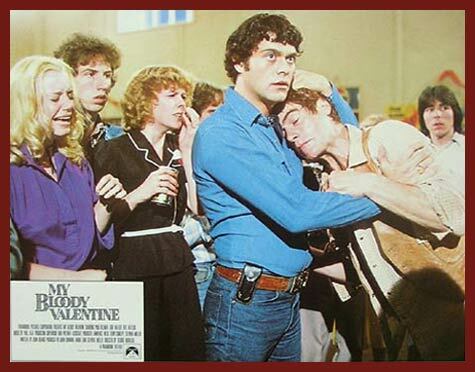 KT: What is your least favorite memory from working on MY BLOODY VALENTINE? PK: Well, there wasn’t anything specific. I can say though that it was a tough shoot. We shot the whole film in about seven weeks, which was ambitious for a rather complex shoot. For me there were a lot of action scenes like the fight with shovel vs. pickaxe between “TJ” and “Axel” (Neil Affleck) especially difficult on a speeding rail car! And having a mine ceiling cave on our heads, “Sarah”(Lori Hallier) and I. And then all of us climbing a vertical steel ladder slippery with mine grease and flowing water! Really the most challenging was just the fact that we were shooting in a mine in the first place. Riding open air wooden mine cars barreling down a mine shaft at what felt like 40 mph in the pitch dark with only our head lamps for light isn’t for the faint of heart! Oh! I do have a ‘least favorite memory’! I just remembered! Some of us were cigarette smokers at the time, I’ve since stopped smoking, and being in a mine the only thing we could do, so as not to blow up the place was — chew tobacco! Just like real miners do! 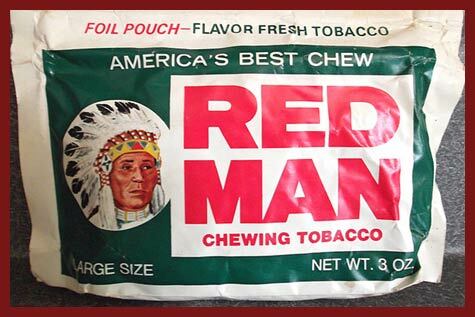 “Redman Chewing Tobacco”! Now chewing that black gunk can be dangerous because if you so much as swallow some of the goo in your mouth, you are going to get real sick and puke your guts out! That’s why you’re always spitting black viscous gobs everywhere! Real manly stuff! I actually liked the taste after a while but spitting black all the time was, well, disgusting. Good for the character though! It was an added touch of realism! 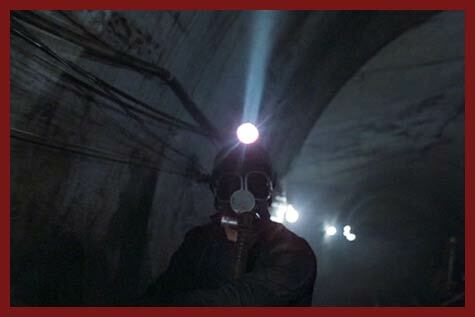 KT: MY BLOODY VALENTINE is now considered to be one of the best slasher films of its era. Many of us are shocked that there was never a sequel. 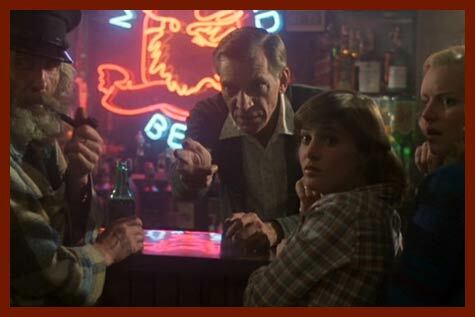 If you were approached either back then or now to reprise your role as T.J., would you accept the offer? PK: You’re kidding right? Of course I’d do it! But I never thought by any stretch of the imagination that the work I did in that movie was special or even good. I can say it was an ‘honest’ performance but nowhere near what I could bring to a role now as an actor. It’s been thirty-three years after all. I’ve walked a few miles since then. I’d be lying if I said that I ever expected MBV81 would become a ‘Cult Horror Classic’! I’d really all but forgot about it until a year or so ago. We did have a special screening with the cast at a theatre in Toronto a few years back and the place was packed. But I figured it was a one-time deal. Then about a year ago it started with a few fans finding me on Facebook. Over that time my Page has developed a constituency of MBV81 Fans! They seem to be from all over the globe young and old! At first I was amused, then surprised and bemused and then something happened. They started talking about what they thought about the film, about me and the horror genre. I realized it really meant something to them and they humbled me with their sincerity and their generosity! They taught me the value of the film and even my work in it! And they showed me how to really value and care about them as an audience and as individuals. It’ been a wonderful experience getting to know them and to share all this with them. And now there are hundreds of fans on the Page and steadily growing! It’s ‘public’ so anyone who wants to can join. They only need send me a “Friend Request” and I’ll confirm. 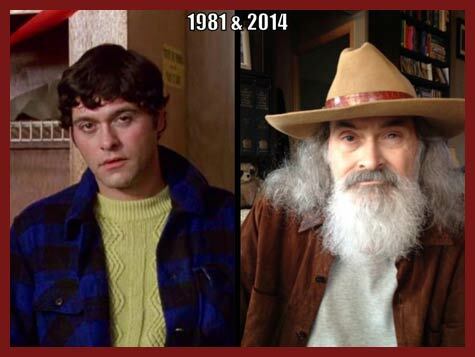 So here I am at age 64, thirty-three years after the fact, a small “c” celebrity because of MBV81. It’s amazing how much I’ve learned from the fans about the movie and the genre. I’ve always loved horror and sci-fi but they, the fans, have turned it into a passion. I’ve always geeked out with action figures from movies and TV,cartoons and even have stuffed animals. I have Fankenstein, Godzilla, Alien and Spiderman as well as Star Trek figures — big Star Trek Fan! I have a ‘Cat in the Hat‘, Popeye and Olive, several Betty Boops and even a 4ft high stuffed Mickey Mouse! “They’re my friends!” (from ’Blade Runner‘). To get back to your question. You mentioned “Sequel.” So many people ask me why there’s not been a sequel? I can’t answer that. But what I can say is that in this life, I’m a writer. And I know some pretty talented fans that can write. And I’ve been gathering ideas from the fan base asking them what they think they want to see in a sequel! So I wouldn’t be surprised that in the coming year . . .
KT: Thanks Paul, It’s an honor! PK: Anytime. My pleasure entirely! Great interview! He seems very kind and open to the fans and the following the film has, which is always cool. Awesome. Always loved MBV81! I used to go to the VHS rental place down the street from me and get it every once in a while. “Older” horror films (not new releases) were $1.00 a day so it was always totally worth it. Is that actually Paul now? I mean, it IS a drastic difference… His eyes look the same though. Way to go KT on the interview! I didn’t even think you did things like this. Great to see this! 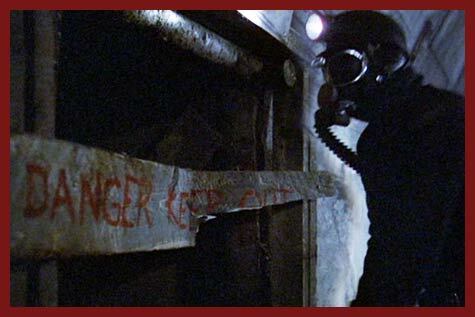 My Bloody Valentine is one of my all-time favorite slashers. Thanks, Mr. Kelman (and nice work, Unk)! Awesome interview! My Bloody Valentine one of my all time favorites and was filmed a hop, skip, and a jump from were I live! Caffeinated Joe is right, he seems like a really nice person.